The ES-1 is discontinued. Its functionality is now available as one mode of the disting. No need for special cables (e.g. TRS to TS 'floating ring' cables). No danger of damage to the interface - the ES-1's inputs are completely standard balanced audio inputs. Much greater output voltage range - up to 9x more than directly connecting a DC-coupled interface via a 'floating ring' cable. Jack inputs - the eight inputs are presented on 1/4" jack sockets, which will accept balanced or unbalanced jack leads. The front panel is 12HP wide. DB25 input - the eight inputs are presented on a single (Tascam TA88 standard) DB25 socket. The front panel is 8HP wide. In both cases the module is 70mm deep. The front panel is drilled for both Doepfer and Analogue Systems mounting holes (using a 'slot' rather than a single round hole). The power connector is a Doepfer standard 16 way IDC, with -12V at the bottom edge of the board. A balanced input stage, capable of accepting balanced or unbalanced inputs. Note that for audio interfaces with differential balanced outputs (e.g. the MOTU Ultralite series) this immediately gives you double the voltage range of using a direct DC connection from the interface. An optional rectifier circuit, for use when the audio interface is not DC-coupled. A jumper on the PCB connects or disconnects the rectifier. An output amplifier and DC offset circuit. This has a gain range of approximately 1x to 4.5x. The DC offset is adjustable, to centre the output of the rectifier circuit around 0V (if desired). Current draw is 43mA on each of the ±12V rails (i.e. 86mA total). Is this essentially the same as the 'special cables' first mentioned on the AC Encoder page? No. The ES-1 is a significantly more sophisticated solution. Why would I buy the DB25 version? What can I connect to it? Typically you would use a DB-25 to jack or XLR loom to connect to your audio interface. This saves space and clutter as compared to using jacks at the ES-1 end. For places that sell such looms see e.g. here (USA), or here (UK). NB be sure to buy an analogue DB25 loom, not a digital one. Will it work with 15V supplies? Will you be making this in other modular formats (e.g. MOTM, Frac)? There are no such plans currently, simply because we only have a Eurorack modular here to test with. 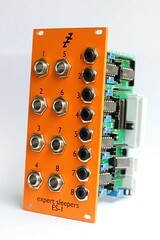 However, you can buy the module without a front panel and build it into any modular format yourself. I don't have a modular but I want to use the ES-1 for my analogue synths. Is this possible? Yes, but you'll need to house and power the ES-1 somehow. One solution is the Doepfer "Beauty Case" which will house the ES-1 plus 3 or so other modules for about $120. 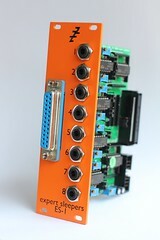 The ES-1 unit is available without a panel, for those that wish to mount it according to their own designs (for example, it might be convenient to route the inputs, especially the DB25 connector, to the rear of a modular synth case) or in non-Eurorack cases. Read ES-1 news articles on the Expert Sleepers blog.